Back on the 7th September, NVIDIA released the GeForce 6600GT's performance figures out in to the open. The GeForce 6600GT is likely to be a very popular seller with an expected retail price of around £160 (or $199 in the USA) and also the fact that it supports NVIDIA’s SLI technology. There was an air of excitement surrounding the board and its rather comprehensive feature set - we can expect to see retail 6600GT boards available in the very near future. On the other hand, ATI, have been keeping quiet about the latest addition to their "X" series of graphics chipsets: it's known as the X700 series. Initially, the X700 series comprises of three boards, which are all based on the PCI-Express interface. ATI are predicting that the reach of PCI-Express is going to increase quite considerably over the next three months with the expected release of several PCI-Express chipsets, including their own, for the Athlon 64 platform. The three boards will fit in to the gap that existed in ATI's product range, which essentially means that they fit in to the same price and performance class as the GeForce 6600 series. The RV410 pipeline is very similar in design to the R423, and supports all of the architectural features that can be found on the Radeon X800 series of GPU's - we'll take a look at the architectural features a little later. The diagram on the left shows the layout of the X700 pipeline, which is very similar to the X800's pipeline (pictured right). There are of course two X800 graphics chipsets; there's the R420, which is based on the AGP interface, and there is also the native PCI-Express R423 GPU. The architectures of the two cores only differ in their native interface. ATI believed that it was important to be the first to use a native PCI-Express interface with their flagship GPU, the X800 series. On the flipside, NVIDIA decided that it made the most sense to bridge to PCI-Express from their NV40 (GeForce 6800) GPU. We won't get into discussion about which way is best - both implementations work very well, and by the time there are games available to utilise the PCI-Express interface's bandwidth in full, the current GPU's will not be regarded as high-end parts. The first thing that is noticed is that the die is fabricated on a smaller fabrication process than the X800 series, but it lacks the performance-enhancing low-k dielectric fabrication of its bigger brother. The low-k dielectric silicon in the X800 series enables high-speed signalling, which increases the speed at which data can be sent around the microchip; however, it is a more expensive process, and thus has been omitted for the lower-cost, more mainstream X700 series. The 110nm manufacturing process is actually just a tweak of the 130nm process rather than a completely new fabrication process - they are physically using the same tools. You'll notice that the CPU vendors traditionally don't bother with these optical shrinks and stick with the base node - Intel certainly went 180nm to 130nm and then to 90nm, but at the end of the day, smaller dies mean more GPU per wafer, allowing ATI to crank them out at a lower cost. Another thing worth noting here is the fact that the X700 series currently has no support for AGP. We asked ATI whether they planned to support the AGP interface with the RV410 - they suggested that there might be scope for support at a later date, but they're adamant in pushing PCI-Express to the mainstream. We remember that NVIDIA explicitly stated that the NV43 would be bridged back to AGP in the near future, which is a slightly different approach to the one that ATI appear to be taking with the RV410. 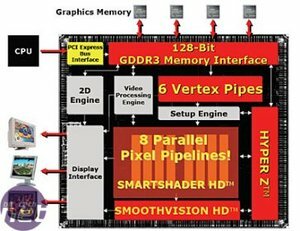 If ATI do choose to support the AGP interface with the X700 series, it is very likely that it is not going to have native AGP support - the cost implications and viability would suggest that bridging back to AGP via a bridge chip similar to the HSI bridge chip that NVIDIA have used on NV45. 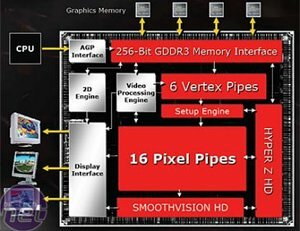 This, to us, makes more business sense than creating a native AGP GPU, and also bridging to PCI-Express from AGP. Bridging from the faster PCI-Express interface back to the AGP interface does not have the potential long-term issues that the opposite bridging method might encounter. We state this with respect to the bandwidth bottleneck that the AGP-to-PCIe bridge chip might suffer from when there are applications available that use the PCI-Express interface in its entirety.